Decorating your home for the holidays is such a creative way to express the joy of the holiday season. Outdoor lighting can add a wonderful welcoming glow to the landscaping while indoor lights really add to the spirit of the holidays. Here are some of the ways to decorate your Hendersonville home. Position spotlights to shine on your landscaping or home. Decorate shrubs with net lighting or strands of outdoor lights. Decorate the front door with a lighted wreath. Outline the roof line or front porch with accent lights. Place lighted holiday snowmen or other figures in the yard. Hang battery operated or solar lanterns from tree branches. Tips: Use a ladder when needed and make sure it is in good condition. Check each rung to be sure nothing is broken. Avoid using staples or nails. Instead, install outdoor lights using insulated holders available at any home improvement store. Plug outdoor lights into a ground electrical outlet, the kind that shuts itself off in a power surge. Test all lights before hanging, and check to see that the lights are waterproof outdoor lights. Be sure to turn lights off before going to bed or put them on a timer. On the tree. Anything from a tabletop tree to a full size masterpiece can be effectively lit. In or around the windows. A single candle in each window or lights hung just inside the perimeter of the window frames can be enjoyed from both inside and outside the home. A lighted wreath on the wall or over the fireplace mantle. Drape miniature lights around a hanging lamp, over the dining room table. Use solar or battery lights to decorate the kitchen or dining room table. Tips: When using extension cords, keep them out of the way. Be sure not put them under rugs, but tape them down, out of the way of traffic areas. Check strands of lights for burned out bulbs and replace them. Hang Christmas tree lights from the top down before hanging other ornaments. When going out, or overnight, turn the lights off or put them on a timer. Use suction cup hooks or easily removable plastic hooks to string lights around windows or along walls. Christmas in the south is spectacular and Hendersonville is no exception. There are beautiful light displays in downtown Hendersonville where you can draw some inspiration for your own home lighting. 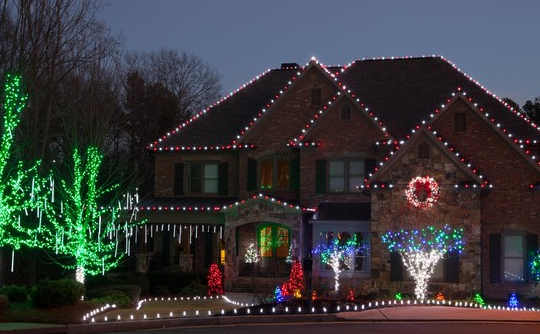 If you are unable to tackle some of the trickier aspects of your Christmas decorating, there are a number of lighting contractors in the area that will install and remove your holiday lights.